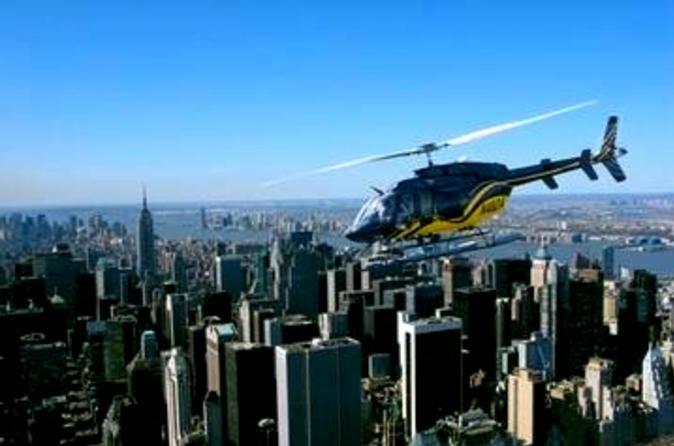 On this New York helicopter flight you will take off from Manhattan's Downtown Heliport and soar into the skies for fantastic photo opportunities of Governor's Island, the Statue of Liberty, New York Harbor and Ground Zero. Upon reaching the World War II aircraft carrier museum, the USS Intrepid, your flight turns around and heads back down the Hudson River to take in New York's world-famous skyline featuring the Empire State Building, Chrysler and Met Life Buildings. Enjoy majestic, once-in-a-lifetime views of many of New York's other historic landmarks, including Ellis Island, where over 20 million immigrants were processed during over sixty years of operation. See Battery Park, the New York Stock Exchange, Federal Reserve Bank and more as you fly over Manhattan. Whether this is your first time in New York City or your 50th visit, a New York Helicopter Flight is a thrilling way to see this great city from a unique perspective you will not soon forget. Special Offer - Book and travel before June 1 to save 34% off our previously offered price - Book Now!